General Motors recalls 175 cars with seat belts that may not protect occupants. 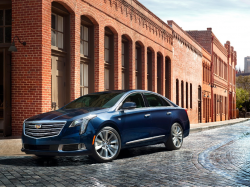 February 19, 2019 — General Motors is recalling 175 model year 2019 Cadillac XTS cars because the seat belt buckles may separate from the cable mounting straps. GM blames the problem on a missing rivet used to secure the seat belt buckle head to the cable mounting strap. An occupant likely wouldn't be properly restrained in a crash, defeating the entire purpose of the seat belt. The recall began on February 7, 2019, providing information to Cadillac CTS owners how dealers will replace the front seat belt buckle assemblies. Customers with questions should call Cadillac at 800-458-8006 and ask about GM recall number N18-2204040. CarComplaints.com has owner-reported complaints about the Cadillac XTS and other Cadillac vehicles.